You would like to be informed about Gilbert & George's new arrivals in advance? Register now for free! 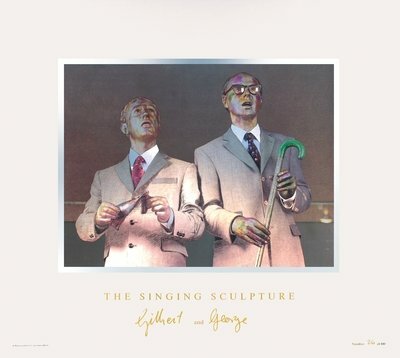 Gilbert & George started working together in 1967. Their idea to put themselves in the center of their artistic practice is still present today. While their continous performance is a major part of their oeuvre it also includes photography and prints. Their aesthetic is without compare in the Western art world and can be imagine somewhere between pop art and church window iconography. When they do not portrait themselves in their artworks they reference current political controversies in a provocative manner. Their way to success is rather remarkable as they took the 1970s international art scene by storm with shows at Stedelijk Museum Amsterdam, Galerie Konrad Fischer und contributions for Documenta 5,6, und 7. The public interest in their performative personalities has not ceased until this day. You want to learn more about the artist? Visit Gilbert & George to get more details about the artist's works. You want to buy artworks and editions of Gilbert & George, but you have further questions? We collected detailed information for this purpose.